There are two different events in which Jesus asks Peter to lower his nets. When He first calls Peter to follow Him and be a “fisher of men” (Luke 5:1-11), and then after His resurrection just before He reinstates Peter (John 21:1-14) with the three “Do you love Me?” questions (John 21:15-19). I’ll be focusing on the second one. As I started thinking about what lowering your nets means, the first thing I noticed is the net has to be empty. We have to come to Jesus empty and ready to be filled with what Jesus has for us. We come to Jesus empty. He knows just what we need, but He is also generous and goes beyond our expectations-beyond what we can think, ask, or imagine (Ephesians 3:20). I think we often limit God by not expecting enough from Him. Many, like me, and those who have gone before us (Moses, Jeremiah, Gideon, to name just a few), have felt less than able to accomplish what God had prepared for us to do. But God has proven that a willing heart is all He needs from us to accomplish his dreams for our lives. My heart is building with excitement as I write! If you read my blog hop post two weeks ago you know how I have stalled on the path of God’s dream for my life. Just yesterday I had lunch with a dear sister in the Lord. She is such an encouragement to me. After lunch we went to the Family Christian store. 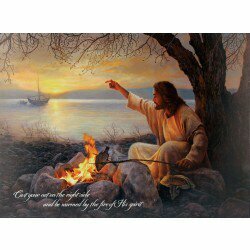 As we were leaving I saw this beautiful print of Jesus cooking fish on the shore as Peter and the others were out on the lake lowering their nets at Jesus’ command. It wasn’t until this morning when I read the daily email for our study that the significance of my seeing that painting yesterday came to me. The painting is depicting the second time Jesus produced a miraculous catch of fish (John 21:1-14). It’s after His trial, torture, crucifixion, death, and resurrection. It’s after the disciples had fled leaving Him alone after His arrest. After Peter’s proud boast of following Jesus to prison or even death, and then His failure as he denied Jesus three times as Jesus predicted (Luke 22:33-34, 54-62). The caption on the print reads, “Cast your net on the right side and be warmed by the fire of His Spirit.” I love that! There’s significance in that it is on the right side. The righteous side. God’s side. We only want to cast our nets where Jesus is. Where He commands us to do so. Where we will haul in good things, the good works that God has prepared in advance for us (Ephesians 2.10). Just as God called to Moses from the burning bush (Exodus 3:4) and Jesus called out to Peter and the others, “Friends, have you caught any fish?” (John 21:5), Jesus calls to each of us through His Word and His indwelling Spirit to cast our nets on the right side and see what a haul God gives each of us. Each of our God-given dreams is different. We should never compare our walk to someone else’s walk, for we each have a different path, with different tests and joys, trials and delights. We are prepared for our God-given dream by what we endure (James 1:2-4, 12, 2 Peter 1:1-11). I have come to accept my former life without shame because all that I have now has come from both the good and bad choices I made. Just like Jesus reinstated Peter after his failure of betrayal to go on and be a founding father of His church on earth, so God is making something beautiful from the mess that I brought to Him (Isaiah 61:3, Romans 8:28) and what you have brought to Him as well. A broken spirit and repentant heart are the sacrifices in which God finds delight (Psalm 5:17). Which is to say, When we come to God with a repentant heart that is broken from our realization of our sinful disobedience, and we come to Him humbled and in obedience to His Spirit and Word, it is to the Lord like a pleasing fragrance (2 Corinthians 2:15, Ephesians 5:2). I have not forgotten the second part of the caption on that beautiful print, “…and be warmed by the fire of His Spirit.” I love that! Warm makes me think of safety and comfort, but fire makes me think of passion and purpose. We can be certain of God’s love and care over every part of our lives, but he wants us to live with passion the purpose He has given to each of us. We are all to love God and love people. To speak His name and spread His Gospel of salvation wherever we go through both word and deed. But the path we each take is a little bit different. We need to work together of course, for our paths are parallel and sometimes intertwined, but we have to be careful to stay on our own paths and not step out on someone else’s path. God’s grace is sufficient for us on our own path, but if we try to walk someone else’s path it does not work for us. I have learned the hard way that God shows us only one or two steps at a time. I am one of those people that can look so far down the road that I lose track of today and the step I am currently upon. Its good to have a plan, but we don’t know what tomorrow may bring, so we need to live in the now and do what God shows us we need to do today (Proverbs 16:9). I’m so glad we are all on this journey to learning how to say “Yes to God” together! The encouragement I have received from my sisters in the Lord through this Proverbs 31 Ministries Online Bible Study of “What Happens When Women Say Yes To God” by Lysa TerKeurst has been a terrific experience. Imagine 24,000 women from all around the world coming together through wonderful things like the internet, email, blogs, videos, Facebook parties, Twitter chats, and phone conferences…God is truly AMAZING indeed! Join me in obediently lowering your net on the right side of you boat, waiting with #PalmsUp in anticipation of what God will load into your net. every good thing that is pleasing to him. All glory to him forever and ever! Amen. Amen & Amen! I loved this “As I started thinking about what lowering your nets means, the first thing I noticed is the net has to be empty. We have to come to Jesus empty and ready to be filled with what Jesus has for us. We come to Jesus empty. He knows just what we need,” He does know exactly what we need. Such a very good message! Thank you Melissa. It was definitely God that revealed that to me. I never thought of that before. Janice, God’s really been speaking to me about that lately. Glad it helped you, too.